China has long been a unified multi-national state. The Chinese nation is composed of 56 different nationalities. 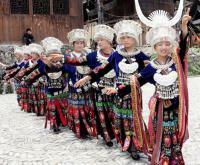 The majority of the Chinese are the Hans, who make up about 92 per cent of China's total population. The name Han originated over two thousand years ago during the Han Dynasty. The minority nationalities - so called because of their relatively smaller populations - differ greatly in size. The Zhuangs are the most numerous, totaling over 15 million, and live mostly in Guangxi, which has been designated as the Zhuang Autonomous Region. There are 12 other nationalities which number more than one million each, including the Mongolians, Huis, Tibetans, Uygurs, Miaos, Koreans and Manchus. Nine comprise less than 10,000 people, with the Russians and Hoches both less than one thousand people. The minority people live mainly in western China, and a small number live in the north and northeast and on islands off the southeastern coast, including Taiwan and Hainan Province.